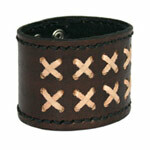 A sturdy wristband bracelet handcrafted by Thai leather jewelry artisans. The artisan adorns the center with light brown leather crosses and holds the interior and exterior bands together with stitching. 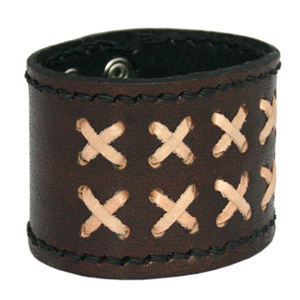 The brown bracelet features snap fasteners closure and is adjustable for 2 wrist sizes. Open (Flat): 23.5 cm length x 5.5 cm width. Closed (Maximum wrist length): 19.0 cm length x 5.5 cm width. Closed (Minimum wrist length): 17.0 cm length x 5.5 cm width.